With safety in mind, Peli™ Products announnces the launch of the new 3315RZ1 ATEX certified light, engineered for professionals working in the fire and rescue, oil & gas, mining, pharmaceutical, hazmat and other high-risk industries. 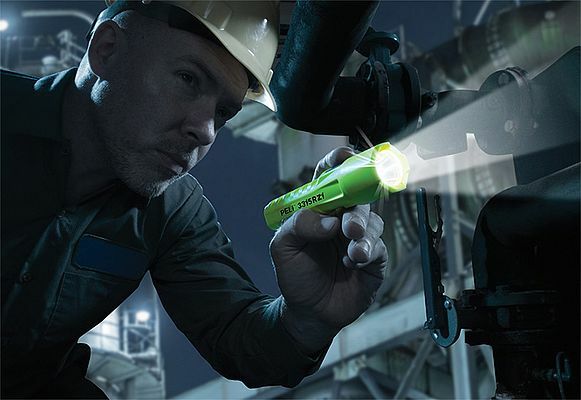 The Peli™ 3315RZ1 is one of the most versatile safety torches available today, thanks to its ultra-compact design, lithium ion rechargeable battery and the ATEX certification Zone 1, Cat. 2. This compact model fits comfortably in your hand and requires little space for storage or transport. The 3315RZ1 produces up to 176 lumens, up to 48 hours of continuous run time in three modes: high, low and flashing. There is a full time battery level indicator built into the power switch so you'll always know when it's time to recharge. This new light is backed by Peli's Legendary Lifetime Guarantee (where applicable by law).